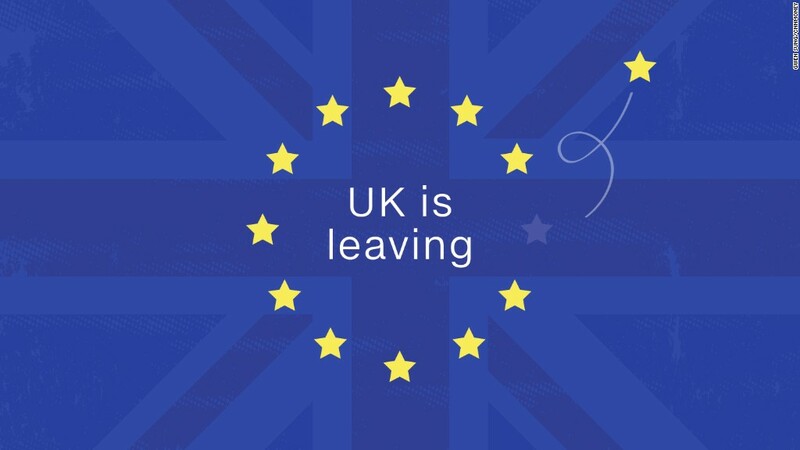 Britain has voted to leave the European Union, a shocking development with profound implications for markets and economies around the world. 1) The results are in: After a long night of vote counting, the final results have been issued: 51.9% of voters chose to leave the EU, while 48.1% wanted to remain. 2) Markets are ugly: Stocks began falling globally almost as soon as the first polls came in. Britain's FTSE 100 shed 3.1%, led by a massive decline in bank shares. Europe suffered even deeper losses: France's stock market tanked 8% and Germany's fell almost 7%. Britain is basically "on sale" as the pound plunged to almost $1.33, its lowest level in over 30 years. In the U.S., the Dow dropped 611 points (3.4%) points, the biggest daily drop since late August when the world worried about China's slowdown. Brexit knocked out all of the gains for the year for U.S. investors. 3) A frantic search for safety: The price of gold spiked as investors poured money into perceived safe havens. Other popular places to stash money right now are U.S. Treasuries, the Japanese yen, the Swiss franc and even Bitcoin. 4) Cameron out: Prime Minister David Cameron, who campaigned against an exit, has announced that he will resign. Without offering a detailed timetable, Cameron said a new leader would be installed by October. 5) Appeals for calm: The Bank of England is under immense pressure to keep markets and banks operating in an orderly manner. In a statement, the central bank said it would "take all necessary steps to meet its responsibilities for monetary and financial stability." Officials and regulators in other countries around the world are also preparing for fallout. South Korea's government called an emergency meeting, while others have called press conferences or issued statements. The U.S. Federal Reserve said it was standing by to help as necessary. 6) How did this happen? Cameron promised voters in 2013 that he would allow a referendum on whether Britain should remain in the European Union. At the time, the chance of exit appeared to be low. But the campaign -- which focused heavily on immigration and the economy -- revealed deep fissures in Britain along both political and geographic lines. 7) The big questions: Britain's decision to exit the EU has injected huge amounts of uncertainty into markets. At this point, investors have more questions than answers -- will the U.K. be able to negotiate new trade deals? How long will that take? Will global banks seek to move their operations out of London? "The U.K. government has a moral but not a legal obligation to leave. The next steps will be dictated by politics, not law," wrote Simon Wells, HSBC's chief U.K. economist in a note Friday. 8) The big takeaway? This isn't a one-day event. The repercussions of the vote to leave are only just beginning, and it has the potential to upend Europe's established political order. Buckle up!